The University of Virginia football team has accepted an invitation to play South Carolina from the Southeastern Conference in the 2018 Belk Bowl at Bank of America Stadium in Charlotte, N.C. The game is scheduled to kick off on Dec. 29 at 12 p.m. ET and will be televised nationally by ABC. 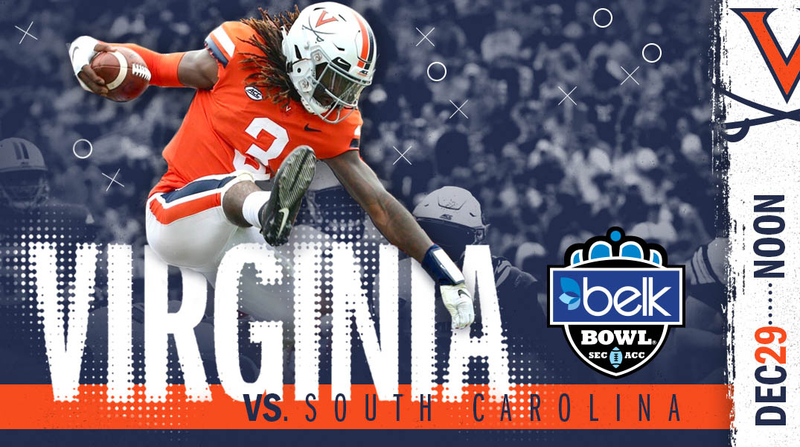 The game will mark Virginia’s third appearance in the Belk Bowl, which is celebrating its 17-year anniversary with the 2018 game. UVA’s previous appearances in the bowl came in first two years of its existence when it was known as the Continental Tire Bowl. Virginia defeated West Virginia 48-22 in 2002 and beat Pitt 23-16 in 2003. The Cavaliers are 7-5 overall and 4-4 in the ACC’s Coastal Division. The Belk Bowl will mark Virginia’s 20th bowl appearance and second consecutive under third-year head coach Bronco Mendenhall. South Carolina is 7-5 and finished 4-4 in the Southeastern Conference’s East Division. “To be selected to play in this year’s Belk Bowl is a tremendous honor for our team and we are excited to return to Charlotte where Virginia won the bowl’s first two games in 2002 and 2003,” Mendenhall said. “One of the team’s goals this year was to play in back-to-back bowl games for the first time in 14 seasons. I am proud they have accomplished that and took another step in establishing the New Standard for the program. It has been a fun and rewarding experience to coach this team. They love to work. They love to get better and they love to compete. Their approach has been consistent and an embodiment of the core principles for the program. They’ll have great focus in their preparation for the bowl game because it is a chance to build on the progress the program has made this year. Virginia and South Carolina renew a rivalry that dates back to 1912 and features 34 previous games between the two teams. The Gamecocks lead the series 20-13-1. The last time the two schools meet came during the 2002 and 2003 seasons. UVA won 34-21 at Scott Stadium while South Carolina took the last matchup, 31-17 at Williams-Brice Stadium. “We are pleased to welcome South Carolina and Virginia to the 2018 Belk Bowl,” said Will Webb, Belk Bowl Executive Director. “The Gamecocks and Cavaliers have each enjoyed a great season, and they should have an exciting, competitive game on the field. Both teams have tremendous, enthusiastic fans that should make the 2018 Belk Bowl very memorable. We look forward to hosting the teams and their fans in Charlotte!" Tickets in Virginia’s block range from $62 to $145 (including ticket fees). Virginia Athletics Foundation donors and football season ticket holders will be eligible to purchase tickets from UVA’s seating block at Bank of America Stadium beginning Sunday shortly after the bowl announcement. The general public may request tickets shortly after the announcement. Should tickets remain, requests made by the general public would be fulfilled on Monday afternoon prior to the open sale. Tickets may be purchased online at VirginiaSports.com. Tickets may also be purchased by calling 1-800-542-UVA1 or in-person at the Virginia Athletics Ticket Office beginning Monday at 9 a.m.